You can never really set the bar high enough in today’s fiercely competitive international market for nutritional bars, where venerable packaged foods giants compete head-to-head with a multitude of fledgling mom-and-pop shops convinced they have discovered the best way to deliver unrivaled physical prowess, stamina and muscle growth. But with the U.S. food-bar market alone estimated to be worth US$5.7 billion in 2011, you can’t really blame companies of all types for trying to get the biggest slice of the market pie they can while the going is good. And there is certainly no lack of effort or will to do just that at Yourbarfactory, a thriving private-label bar manufacturer that custom produces and packages bar products to the brand-owners’ exact specifications at the company’s gluten- and nut-free manufacturing facility in Montreal. Originally started up in 1985 for the primary purpose of manufacturing marshmallow squares under the Rapid Snack brand label, Yourbarfactory has grown in leaps and bounds in the last three decades by helping many prominent food manufacturers around the world to bring their bars to market in timely manner. 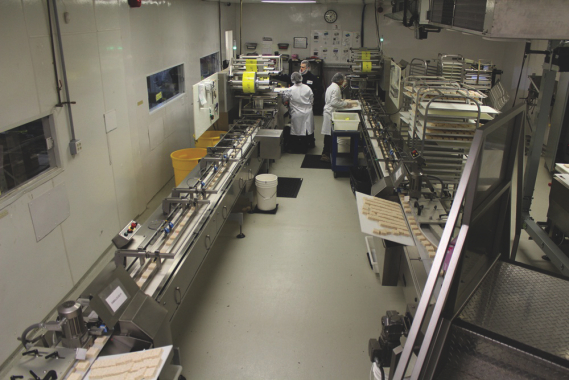 Employing about 70 full-time personnel, the 40,000-square-foot facility nowadays boasts capacity to produce 150 million bars per year for a growing global customer base spanning more than 10 countries worldwide. 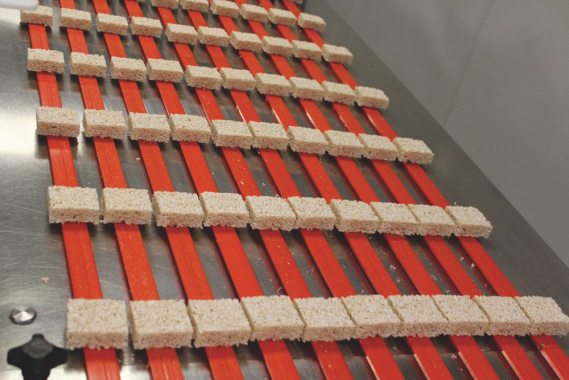 A row of freshly-made marshmallow crispy squares is fed towards the flowrapping section via a fast-moving split conveyor belt that can be easily changed by plant’s personnel to accommodate fast product changeovers in minutes without any tools. “We can either create a new product to your specifications or start from one of our existing formulations to get inspired and adapt it to your needs,” the company’s website proudly states. 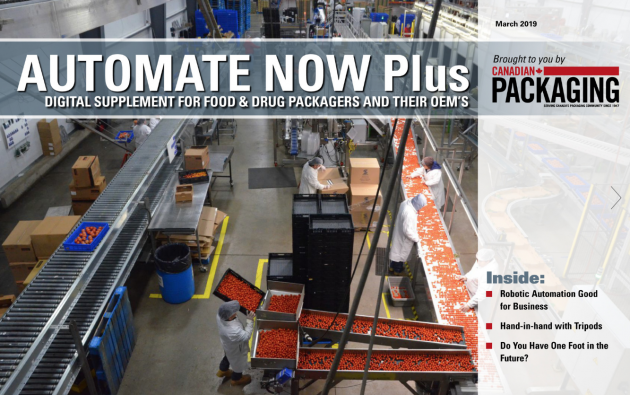 In addition to manufacturing a wide assortment of food bars—including sport-and-fitness and diet-and-nutrition supplements—Yourbarfactory also offers its customers a comprehensive range of much appreciated value-added services, including packaging, distribution and logistics support, and market consultation. This includes formulation of theoretic recipes, label and packaging approval, production of samples, sourcing of new ingredients, writing of the nutritional statements, and providing valuable key trend intelligence and information on current market trends and conditions. 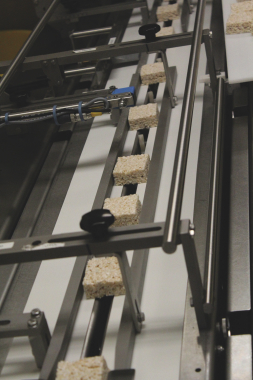 Marshmallow squares coming out of the processing area are spread out in neat multiple rows for packaging. According to the company, this all translates into a shorter product development cycle and smoother product launches for the company’s private-label customers. The company’s ‘A-to-Z’ business model for bar production has been so well received that Yourbarfactory enjoyed robust 30-percent business growth between 2004 to 2014. The Pack 401 flowrappers at Yourbarfactory are capable of achieving speeds of up to 650 pieces per minute. While great for the bottom line, the soaring demand also exposed some of the existing process inefficiencies on the production lines that needed urgent improvement—making the need to automate the plant’s antiquated packaging line operation a top capital investment priority. The old method­—whereby the plant’s processing and packaging lines were decoupled, the bars manually collected after they were formed, and then transferred to the packaging area to be manually fed into horizontal flowwrappers for packaging—simply became too slow to keep up with rising production volumes. 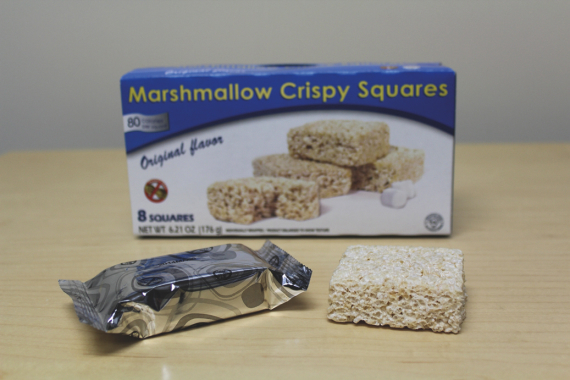 Foil-wrapped marshmallow crispy squares exiting the Pack 401 machine’s discharge section at high speeds. “The process was very labor-intensive, requiring 10 people for manually transferring the bars and feeding our four flowwrappers,” recalls Yourbarfactory’s technical director Cedrick Boivin. “Our maximum production rate at the time was 400-ppm (products per minute), or 100-ppm per flow wrapper,” Boivin divulges. “The end result was considerable waste and downtime, with product losses of five to seven per cent not uncommon with this process flow,” he relates. “Also, the product changeover and cleaning time on those machines was quite considerable. The Yourbarfactory plant takes care of all of its customers’ packaging requirements and materials. 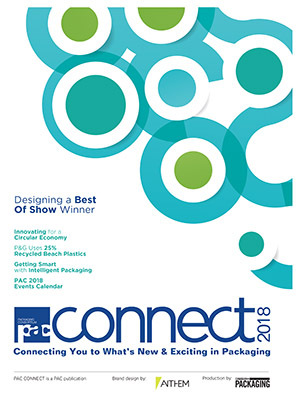 After carefully researching several options to upgrade his packaging line, and receiving proposals from numerous well-respected packaging equipment manufacturing companies, Boivin ultimately decided to go with the automated packaging solution and equipment offered by Bosch Packaging Technology. Headquartered in the town Waiblingen near Stuttgart, Germany, Bosch Packaging is a well-renowned, globally operating manufacturer of automated process and packaging equipment, as well as an expert integrator of complete system solutions for the global food-and-beverage, pharmaceutical and confectionery industries. “We analyzed the TCO (total cost of ownership) estimates from a wide range of flowwrapper suppliers and Bosch came out on top,” recounts Boivin. 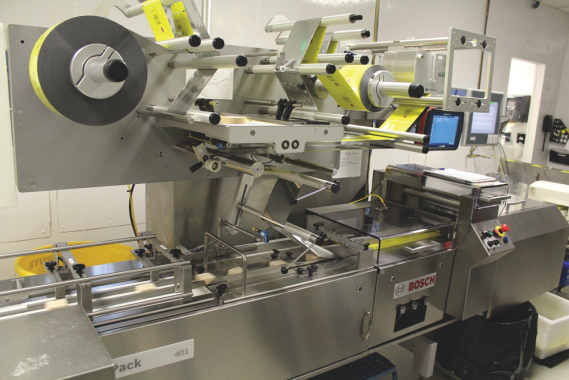 “We already knew the solid reputation of the company’s Doboy brand of wrappers, and during the selection process we developed a good, trusting relationship with our local Bosch sales representative, Fred Farago, who made a strong case for selecting Bosch Packaging’s Pack 401 flowwrapper and feeding system for our operations. “After he showed us the significant advantages in using this particular equipment to maximize our packaging line efficiency, our capital investment decision became quite easy,” Boivin relates. 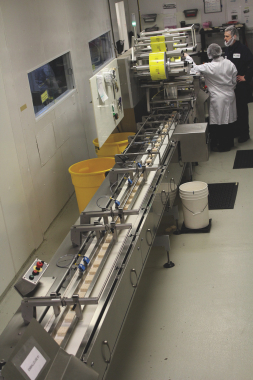 In early 2013, the Yourbarfactory plant proceeded to install two model Pack 401 horizontal flowwrappers with a Bosch Pack Feeder 4 infeed system, Boivin relates. Click HERE to watch a video of the packaging line at Yourbarfactory. Boasting film speeds of up to 80 meters per minute, the high-performance Pack 401 horizontal flowwrapper can achieve output levels of up to 600 products per minute—perfectly fitting Yourbarfactory’s speed requirements—with its modular design enabling seamless integration with Delta-type pick-and-place robotics, various infeed modules, product handling equipment, and secondary packaging machinery. Engineered to ensure a high degree of reliability and efficiency, according to Bosch Technology, the Pack 401 flowwrapper incorporates advanced gap control technology to produce consistent, repeatable and precise seal integrity, while a standard dual-spindle back-stand with power feed rollers allows for full automation with vastly improved splicing, cutting, auto tracking and tight cutoffs. For its part, Bosch Technology’s Pack Feeder 4 infeed system­ was designed as a cost-effective solution for packaging bakery and confectionery products in plastic cardboard trays, according to the company, featuring tool-less belt changes and an easy-to-clean design for minimal maintenance requirements and optimal machine uptime. 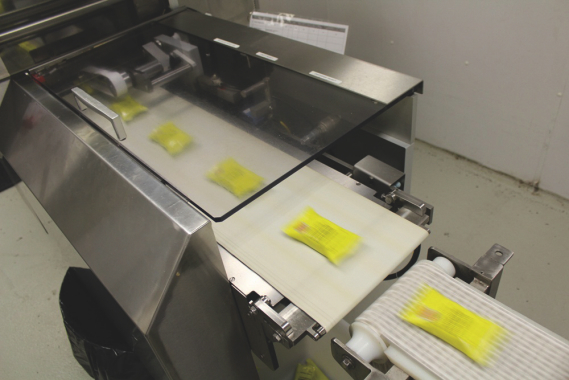 In addition to the flowwrappers and the feeder, Yourbarfactory also installed a new product distribution system (PDS) using row removal stations to automatically transport the bars from the processing to the packaging lines, Boivin points out. “Adding the Bosch equipment has made our packaging line an extremely efficient operation,” Boivin enthuses. “It now requires only two operators to run it—allowing us to redirect our existing manpower to the higher-skilled tasks that add real value to the process. “Moreover, the new equipment has helped us to achieve output rates of 650-ppm,” he extols. 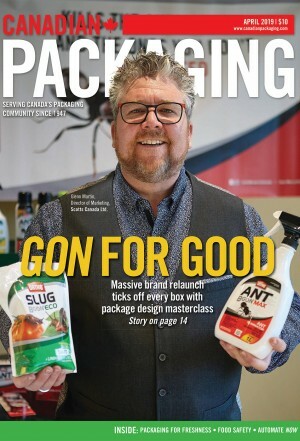 “It also helped us to reduce our product waste dramatically to less than one per cent for high-volume products,” he says, praising the abundance of optional and standard features on the Pack 401 wrappers that enabled further improvements in efficiency and time-savings throughout the line. 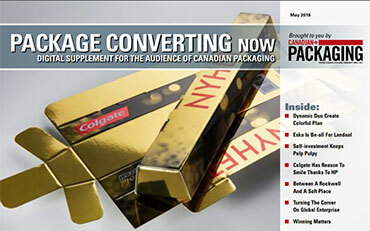 “When launching a new product, when production runs are usually less than 100,000 bars, our packaging speeds slow to around 150 ppm,” Boivin notes. “For these small runs, the system’s automatic ‘No product/No paper’ feature considerably reduces the film waste on our end—thereby creating significant cost-savings for a startup customer,” notes Boivin. 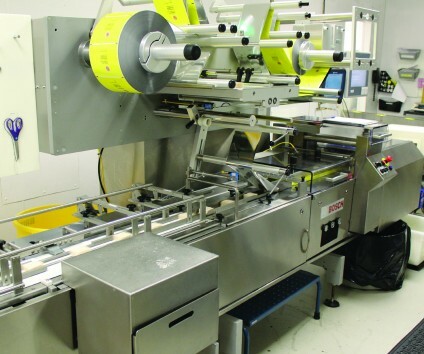 Another key benefit is that the Pack 401 system’s automatic film splice eliminates downtime for film changes and the auto reject mechanism on the infeed prevents jams from occurring. “In the past, our flowwrappers were down for at least five minutes every hour, whereas now any downtime is a rare occurrence,” he says. An overview of the Yourbarfactory plant’s recently automated packaging area, where technical director Cedrick Boivin (in blue lab coat) is discussing the line’s performance with the two machine operators running it. 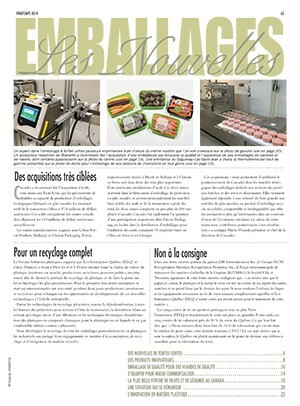 Moreover, Boivin cites a 50-percent reduction in cleaning time for the wrappers and feeders—thanks to the easy belt removal and a highly hygienic overall design that effectively removes the risk of cross-contamination in an environment where many different products are manufactured within a brief time-frame. “As one can imagine, packaging different bars every few days on the same line requires a high amount of flexibility,” states Boivin. According to Boivin, the success of the plant’s automation investment in Bosch Packaging equipment already has the company considering additional similar upgrades as the business continues to grow. And with a move to a bigger production facility tentatively scheduled for 2016, the final chapter of Yourbarfactory’s success with packaging automation is yet to be written.